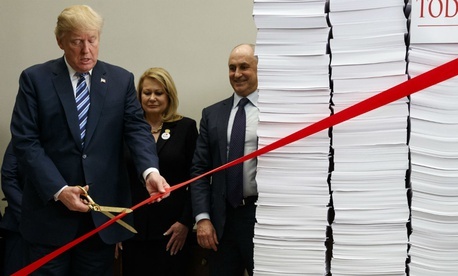 The rollback of health and safety regulations celebrated as an economic boon by the White House has just been quantified. The Trump administration in just over a year has withdrawn or paused more than 1,500 ongoing rulemakings, according to a report released on Tuesday by the liberal-leaning Public Citizen. “That vastly exceeds the number under President Barack Obama at a similar point in his administration and roughly parallels the number under President George W. Bush,” wrote Michael Tanglis and staff in the paper titled “Deregulatory Frenzy.” The paper analyzed 20 years of data from the unified agenda published by the Office of Management and Budget. “President Donald Trump has withdrawn substantially more rulemakings deemed ‘significant’ (279) than either of his most recent predecessors at this stage of their administrations,” the report said. Rulemakings are categorized as “significant” if they are projected to have an economic impact of more than $100 million or if they meet certain criteria, such as raising novel policy issues or affecting multiple agencies. The agencies that have withdrawn the most rules deemed significant are the departments of Health and Human Services, Agriculture, Justice and Labor. Before her nomination, Rao’s research as a law professor at George Mason University “reflected a strong antipathy toward regulatory safeguards,” the report said. In surveying the deregulatory agenda in areas such as the environment, labor and finance, the paper argued that in contrast to Trump’s rhetoric, regulation is “broadly popular,” democratic in process and protects not only individuals but businesses by giving them certainty. The reason, she said, is “corruption. Giant corporations and wealthy individuals are working in the shadows to make sure that government works for them, not for the people. To hide what they are doing, big corporations and Republicans here in Washington often claim that government regulations are bad for our economy,” restrict freedom and make it harder for businesses to succeed. “That’s a big, greasy baloney sandwich that has been left out in the sun too long and has started to stink,” she said. Warren said she will introduce legislation in the next few weeks to challenge campaign contributions corporate lobbyists make to steer agency regulations. The EPA alone is working on as many as 66 repeals of key rules, said Elizabeth “Betsy” Southerland who last August resigned in protest from EPA’s Office of Science and Technology, speaking at a subsequent panel discussion. Those repeals are being executed with consultation only with industry representatives, not career scientists or engineers, Southerland said, “with no evidence that the existing rules have technical or procedural flaws.” Because of the long-term rule-making process, she said, the full impact of this roll-back won’t be clear until 2024.